As Foursquare makes deals with major media companies, competitor Loopt is continuing to partner with with content companies to offer fresh news and reviews of restaurants, bars, businesses and events. Loopt’s mobile apps incorporates local content, deals and reviews about restaurants, bars and events from Zagat, Citysearch, Bing, and most recently Mobile Spinach. Today, Loopt is announcing a partnership with Tasting Table, daily epicurean email about restaurants, bars, wine stores and cookshops in New York, Los Angeles, San Francisco, Chicago and Washington D.C.
Loopt users can find Tasting Table-approved restaurants and bars within Loopt Pulse on Loopt’s free mobile application. Tasting Table recommendations range from directions, menus, editorial insights, special offers, and more. 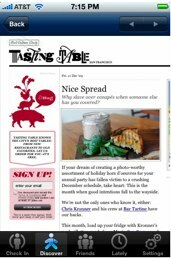 Tasting Table’s editorial coverage is based on first-hand research from local editors who eat and live in the cities they cover. In addition to being able to “check into” the restaurant, Loopt users add their input and tips for other users interested in the same establishment. With 3 million users, Loopt is continuing to innovate its platform to compete in a competitive space, where Facebook may be entering as well. The pioneer of the mobile social network is launching a new app called LooptCard, which lets mobile consumers tap into offers, coupons and discounts by checking-in to spots. Location-based deals are one part of the picture; with check-ins, advertising and even merchant reviews and listings all included as features.